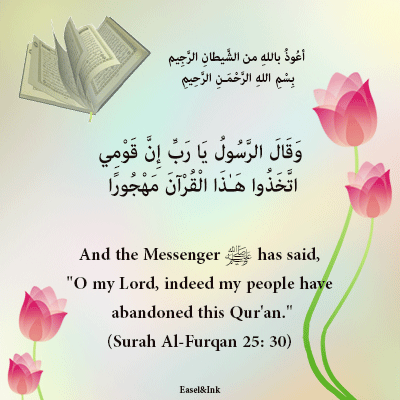 And those who disbelieve say: "Listen not to this Qur'an, and make noise in the midst of it.'') (41:26). When he ﷺ would recite Qur'an to them, they would talk nonsense or speak about something else, so that they would not hear it. This is a form of forsaking it and rejecting it, and not believing in it is the same as forsaking it, and not pondering its meanings and trying to understand it is the same as forsaking it, and not acting upon it and following its commandments and heeding its prohibitions is the same as forsaking it, and turning away from it in favor of poetry or other words or songs or idle talk or some other way is the same as forsaking it. We ask Allah, the Most Generous, the Bestower of bounty, the One Who is able to do what He wills, to keep us safe from doing that which earns His wrath and to use us to do that which will earn His pleasure of preserving and understanding His Book, following its commandments night and day in the manner which He loves and which pleases Him, for He is Generous and Kind. Reference: Tafsir ibn Kathir (abridged) English version.